Science and Humanities Departments connected with all department in Tagore-IET. 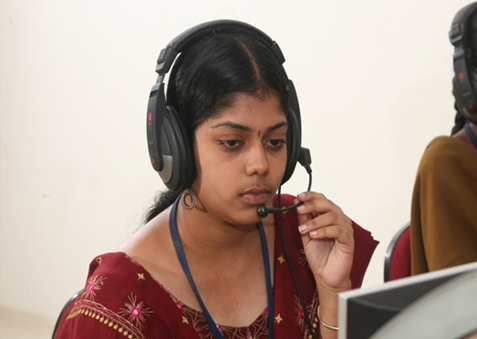 We Provide basic skills set to our students, whenever required. Informing the student with the latest development in science. Therefore he can exploit it for development of technology. Provide specialized training for students in the Science, Technology, Engineering and Mathematics(STEM) fields. Produce Graduate with the ability to impact discipline – specific knowledge. The mission of Science and Humanities is to: Inculcate basic knowledge in Science, Technology, Engineering and Mathematics (STEM) fields. Make the students to increase their CGPA (Cumulative Grade Point Average). The major part of Technical English and Mathematics are: To develop communication skills in order to get effective placement. To develop them to face competitive exams. Giving more weightage to reasoning and testing ability. The Department of Physics provides high quality Physics education, producing well prepared graduates who are confident in their abilities and understanding of Physics. 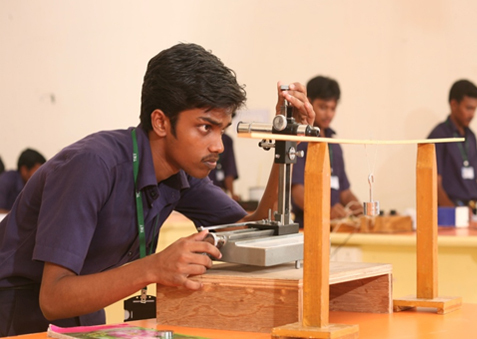 The department's objective is to impart very good training in engineering based Physics in the first year. The knowledge gained here will have a sound footing in all later semesters. The mission of our department is to offer appropriate curricular inputs related to Analytical Physics. The Chemistry Department provides the opportunity for an undergraduate student to obtain a thorough fundamental knowledge of all fields of chemistry. From the very beginning both teaching and research remained very important in this department. 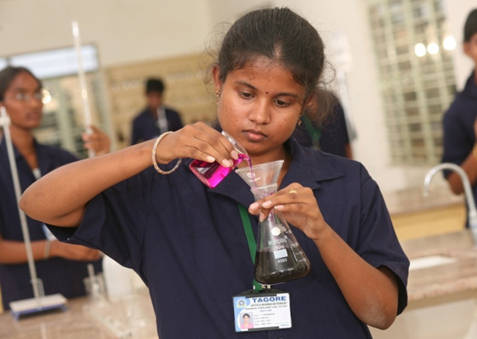 In teaching, the classroom as well as laboratory teaching is given equal importance. More important than the formal lecture and laboratory courses is the intellectual environment provided by the department. Mathematics plays a vital role in the scientific study of various processes and activities in problem of all walks of life. The Department of Mathematics offers courses in Engineering Mathematics, Probability & Random processes, Discrete Mathematics and Computational Mathematics to qualify the students in the respective fields. A variety of innovative programmes on Mathematics are conducted for students to improve their knowledge in application of Mathematics and ability to work in a team. The Department of English of Tagore Institute of Engineering and Technology is dynamic with resources keen on developing the overall language skills of the students. It strives to attain this objective by imparting communication skills to the budding Technocrats in both social and professional contexts. Apart from the regular course work, the Department handles classes for the senior students, training them to enhance their job skills through Soft Skills and Spoken English. English Literary and Debating Society are part of its regular activity. The English Language Lab helps in honing the cognitive skills and caters to the Intellectual Zeal of the learners providing a conducive aura and ambiance. The lab has Hi Class Software (Installed in 2008) which offers a variety of functions such as Recording, High Speed Copying, Test Preparation, Student Monitoring, Teacher/Student Call, Group Conferencing, etc. The main console is connected to 30 listening booths which have been specially designed for student-teacher interaction, and greater concentration for language learning. The lab also has a large number of cassettes and books for all levels: beginners, intermediate and advanced. Variety of listening and speaking drills for Remedial English classes. Benefits students who are deficient in English and also aims at confidence-building for interviews and competitive examinations. The Language Laboratory sessions also include word games, quizzes, extemporary speaking, debates, skits etc. The classes for I-year student for the academic year 2016-2017 inaugurated on 25th July 2016. 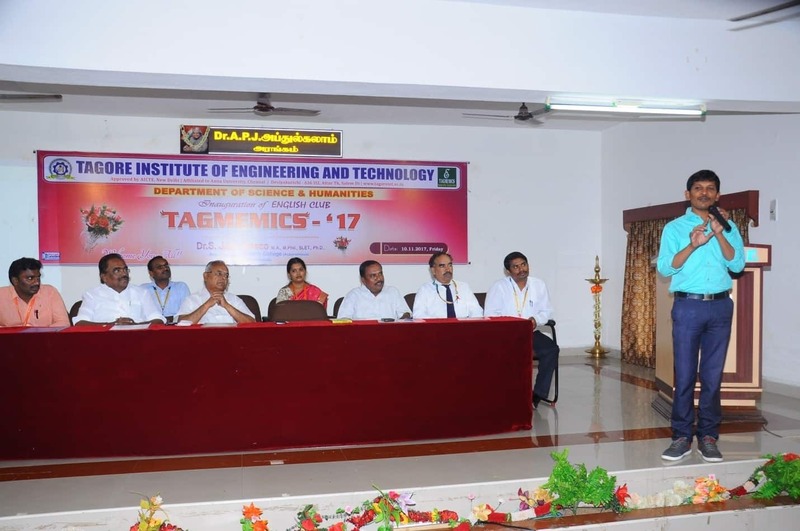 Dr.T.Krishnakumar, Head, Department of Science & Humanities given a welcome address and Dr.S.Senthilkumar, Principal delivered a principal address. The presidential address was given by Thiru R.Lakshminarayanan, President, Tagore Educational Institution. The felicitation address was given by the management members. The chief guest address delivered by the JFF Rajeswari Venkataraman, National Trainer, JCI, Zone 17. Finally the vote of thanks given by Dr.R.Vasanthi, Head, Department of Computer Science Engineering. Department of Science & Humanities decided to inaugurate the English Club TAGMEMICS ’17 at our college with the view to develop the Communicational skills, besides augmenting their personality traits. It has been decided that various events should be conducted by the club from time to time. The English Club of Tagore Institute of Engineering and Technology was inaugurated on 10.11.2017 (Friday) at APJ.Abdul Kalam Auditorium. The inaugural ceremony of the club was started at 10.30 am with a song of invocation followed by the traditional custom of igniting the lamp. The ceremony of the igniting the lamp had been initiated by the Joint Secretary, Tagore Educational Institutions and was followed by the director, the Chief Guest, the Principal, the HOD of S&H and a student. After the ignition of lamp, Joint Secretary, the directors were honored the Chief Guest with a shawl and a bouquet. Student Representative welcomed the gathering. Dr.S.Senthilkumar, the Principal of the college delivered the Principal’s address. Followed by the Presidential’s address, Mr. R.Lakshminarayanan, explained about the development of the English language in contemporary world Subsequently, Dr.S.John Bosco, and the Chief Guest of the day delivered a detailed note of English language, explained about love, gratitude and methods of learning the language by adapting an easy-to-follow approach. Students Representatives are introduced before the dignitaries and students. As a part of TAGMEMEICS ‘17, various events were conducted by the English Club. Moreover, the winners of the events were appreciated and honored during the function. All the winners and participants were encouraged with certificates. The certificates for the winners and participants were granted by the Chief Guest, the directors and the Principal of Tagore Institute of Engineering and Technology. Further, all the winners were appreciated by the dignitaries of the day. The function was followed by a valedictory session. Student Representative delivered vote of thanks. Then the function came to an end with National Anthem. The students are encouraged to organize themselves into Mathematics clubs and Mathematics associations. Under the auspices of this organization, discussions, certain games based on some concepts of mathematics and mathematical problems can be arranged. This is likely to help the students in having an idea of the practical utility of mathematics in addition to creating their interest in mathematics. The Mathematics Club of Tagore Institute of Engineering and Technology was conducted TAGMATH’18 on 06.04.2018 at Dr. A.P.J. Abdul Kalam Auditorium. The inaugural ceremony of the club was started at 10.30 am with a song of invocation followed by the traditional custom of igniting the lamp. The ceremony of the igniting the lamp had been initiated by the Joint Secretary, Tagore Educational Institutions and was followed by the Director, the Chief Guest, the Principal, the HOD of S&H and a student. After the ignition of lamp, Joint Secretary, the directors were honored the Chief Guest with a shawl and a memento. Student Representative welcomed the gathering. Dr.S.Senthilkumar, the Principal of the college delivered the Principal’s address. Dr A. Praveen, the Chief Guest of the day delivered a detailed key note address on the Mathematics club and explained the role of Maths in the development of world. The event became all the more successful with the overwhelming presence of Mr. R. Lakshminarayanan, Educational committee member Mr. P.Somasundaram, President, Mr.R. Chinnusamy, Vice President, Mr.K. Arunkumar, Secretary, Mr.P. Kaliyannan, Treasurer and Directors of Tagore Educational Institutions. As a part of TAGMATH’18, various events were conducted by the Maths Club. Moreover, the winners of the events were appreciated and honored during the function. All the winners who attained the first three positions were encouraged with prizes and certificates. Participants were appreciated with certificates of appreciation. The certificates and prizes for the winners were granted by the Chief Guest, the Directors and the Principal of Tagore Institute of Engineering and Technology. Further, all the winners were appreciated by the dignitaries of the day. The function was followed by a valedictory session. Then the function came to an end with National Anthem. Chief Guest: Dr A.K. Ramasamy, Former Professor & Head, Department of Chemistry, Periyar University, Salem. Department of Science & Humanities inaugurated and celebrated National Science Day on February 28, 2018. The Science Club conducted various activities to promote active involvement and better understanding of scientific concepts, cultivation of an awareness of science, the familiarization of the student with scientific research, the encouragement of critical thinking and enable students to know about the latest developments in the field of science and technology. 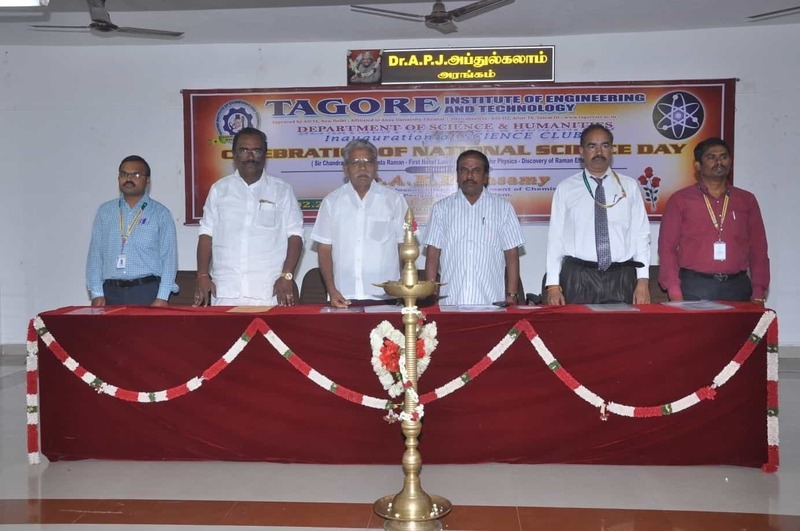 The Science Club of Tagore Institute of Engineering and Technology was inaugurated and celebrated National Science Day on 28.02.2018 at Dr. A.P.J. Abdul Kalam Auditorium. The inaugural ceremony of the club was started at 11.30 am with a song of invocation followed by the traditional custom of igniting the lamp. The ceremony of the igniting the lamp had been initiated by the Joint Secretary, Tagore Educational Institutions and was followed by the director, the Chief Guest, the Principal, the HOD of S&H and a student. After the ignition of lamp, Joint Secretary, the directors were honored the Chief Guest with a shawl and a bouquet. Student Representative welcomed the gathering. Dr.S.Senthilkumar, the Principal of the college delivered the Principal’s address. Followed by the Felicitation’s address, Mr.N.R. Palanivel, Director, explained about the importance of science and motivated the students by delivered the detailed speech about Sir.C.V.Raman and Dr.A.P.J.Abdul Kalam. Subsequently, Dr A.K. Ramasamy, the Chief Guest of the day delivered a detailed key note address on the Science & Technology and explained the role of science in the development of world. The event became all the more successful with the overwhelming presence of Mr. R. Lakshminarayanan, President, Mr.R. Chinnusamy, Vice President, Mr.K. Arunkumar, Secretary, Mr.P. Kaliyannan, Treasurer and Directors of Tagore Educational Institutions. Office bearers for science club are introduced before the dignitaries and students. As a part of Celebration of National Science Day, various events were conducted by the Science Club. Moreover, the winners of the events were appreciated and honored during the function. All the winners who attained the first three positions were encouraged with prizes and certificates. Participants were appreciated with certificates of appreciation. The certificates and prizes for the winners were granted by the Chief Guest, the directors and the Principal of Tagore Institute of Engineering and Technology. Further, all the winners were appreciated by the dignitaries of the day. The classes for I-year student for the academic year 2012-2013 were inaugurated on 10th September 2012. 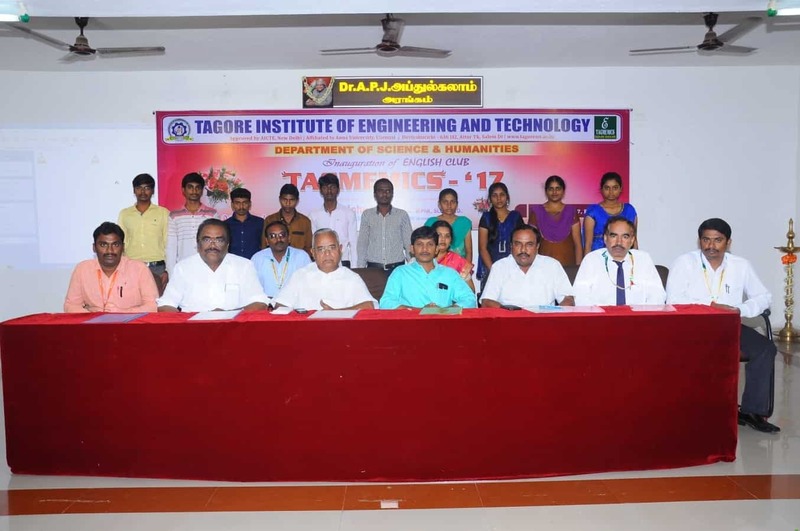 Dr. T. Krishnakumar, Head, Department of Science and Humanities given a welcome address and Dr. P. Prakasam, Principal delivered a principal address. 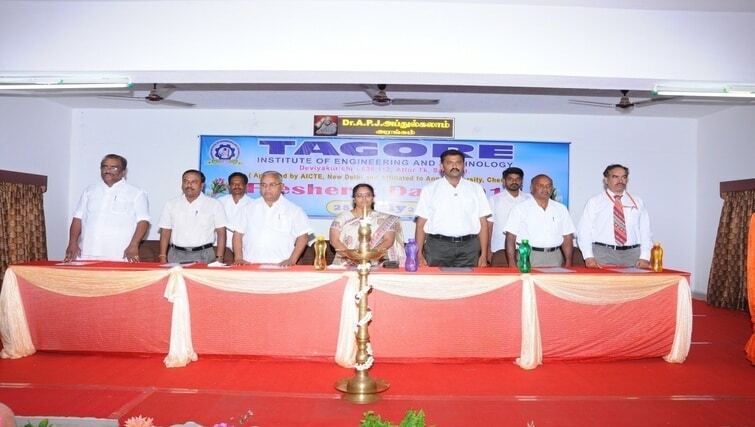 Thiru K. Vijayakumar, President, Tagore Educational Institutions delivered the presidential address. The felicitation address was given by the management members. The chief guest address delivered by the Thiru P. Somasundaram, Educational Committee member, Tagore Educational Institution. Finally the vote of thanks given by Mr. K. Balasubramaniyan, Head, Department of Electrical and Electronics Engineering. The classes for I-year student for the academic year 2013-2014 inaugurated on 1st August 2013. Dr. T. Krishnakumar, Head, Department of Science and Humanities given a welcome address and Dr.P. Prakasam, Principal delivered a principal address. The presidential address was given by Thiru. K. Vijayakumar, President, Tagore Educational Institution. The felicitation address was given by the management members. The chief guest address delivered by the famous media speaker Thiru. Suba Marimuthu. Finally the vote of thanks given by Mr. K. Balasubramaniyan, Head, Department of Electrical and Electronics Engineering. The classes for I-year student for the academic year 2014-2015 were inaugurated on 1st August 2014. Dr. T. Krishnakumar, Head, Department of Science and Humanities given a welcome address and Dr. A. Sivasubramanian, Principal delivered a principal address. The felicitation address was given by the management members. The chief guest address delivered by the Thiru P. Somasundaram, President, Tagore Educational Institution. Finally the vote of thanks given by Ms. K. Nithya, Assistant Professor, Department of English. Department of Science & Humanities organized the Independence day celebration on 13th August 2014 for the 1st year students in college seminar hall. Dr. T. Krishnakumar, Head, Department of Science and Humanities given a welcome address and Dr. A. Sivasubramanian, Principal delivered a principal address. The felicitation address was given by the management members. Thiru P. Somasundaram, President, Tagore Educational Institution delivered the chief guest address about the Independence and our patriotism. The students exhibited their cultural events and skills related to Independence Day. Finally the vote of thanks given by Ms. K. Nithya, Assistant Professor, Department of English. Department of Science & Humanities decided to celebrate the 70th Independence Day at our college with the view to develop the patriotism of the students, besides augmenting their personality traits. It has been decided to perform various cultural events should be conducted by the department from time to time. The 70th Independence Day celebrated on 22.08.2016 (Monday) at APJ.Abdul Kalam Auditorium. The Celebration started at 10.30 am with a song of invocation followed by the traditional custom of igniting the lamp. The ceremony of the igniting the lamp had been initiated by the Joint Secretary, Tagore Educational Institutions and was followed by the director, the Chief Guest, the Principal, the HOD of S&H and a student. After the ignition of lamp, Joint Secretary, the director were honored the Chief Guest with a shawl and a bouquet. Student Representative welcomed the gathering. Dr.S.Senthilkumar, the Principal of the college delivered the Principal’s address. Followed by the Presidential’s address, Mr. N.R.Palanivel, Educational committee member, explained about the freedom fighters struggles and troubles Subsequently, Prof.Geoffrey Davidson, the Chief Guest of the day delivered a detailed key note about the Independence and life history of freedom fighters. As a part of celebration AZADI’70), various events were conducted by the English Club. Moreover, the winners of the events were appreciated and honored during the function. All the winners who attained the first position were encouraged with trophies and certificates. Winners who attained either second or third positions were appreciated with certificates of appreciation. The certificates and trophies for the winners were granted by the Chief Guest, the directors and the Principal of Tagore Institute of Engineering and Technology. Further, all the winners were appreciated by the dignitaries of the day. At last Students exhibited their patriotism through cultural events. After the cultural events, the function was followed by a valedictory session. Student Representative delivered vote of thanks. Then the function came to an end with National Anthem. Department of Science & Humanities inaugurated and celebrated National Science Day on February 28, 2017. The Science Club conducted various activities to promote active involvement and better understanding of scientific concepts, encourage scientific thinking and enable students to know about the latest developments in the field of science and technology. The Science Club of Tagore Institute of Engineering and Technology was inaugurated and celebrated National Science Day on 28.02.2017 at Dr APJ Abdul Kalam Auditorium. The inaugural ceremony of the club was started at 01.30 pm with a song of invocation followed by the traditional custom of igniting the lamp. The ceremony of the igniting the lamp had been initiated by the Joint Secretary, Tagore Educational Institutions and was followed by the director, the Chief Guest, the Principal, the HOD of S&H and a student. After the ignition of lamp, Joint Secretary, the directors were honored the Chief Guest with a shawl and a bouquet. Student Representative welcomed the gathering. Dr.S.Senthilkumar, the Principal of the college delivered the Principal’s address. Followed by the Presidential’s address, Mr. R. Lakshminarayanan, President, explained about the development of the Science & Technology. Subsequently, Dr A.K. Ramasamy , the Chief Guest of the day delivered a detailed key note address on the Science & Technology. Mr. S.Sharavanan, the Chief Guest delivered a detailed key note on the Wildlife & Nature Science. Students Representatives are introduced before the dignitaries and students. 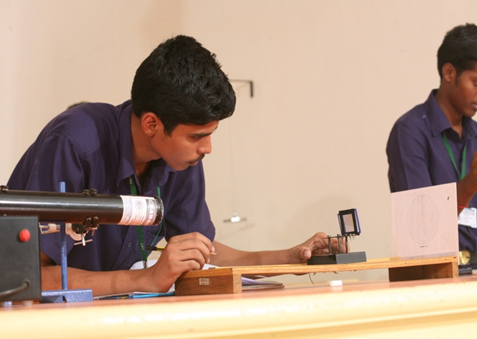 As a part of Celebration of National Science Day, various events were conducted by the Science Club. Moreover, the winners of the events were appreciated and honored during the function. All the winners who attained the first position were encouraged with prizes and certificates. Winners who attained either second or third positions were appreciated with certificates of appreciation. The certificates and prizes for the winners were granted by the Chief Guest, the directors and the Principal of Tagore Institute of Engineering and Technology. Further, all the winners were appreciated by the dignitaries of the day. The function was followed by a valedictory session. Mrs. R.Ranjitham, Assistant Professor, delivered vote of thanks. Then the function came to an end with National Anthem. 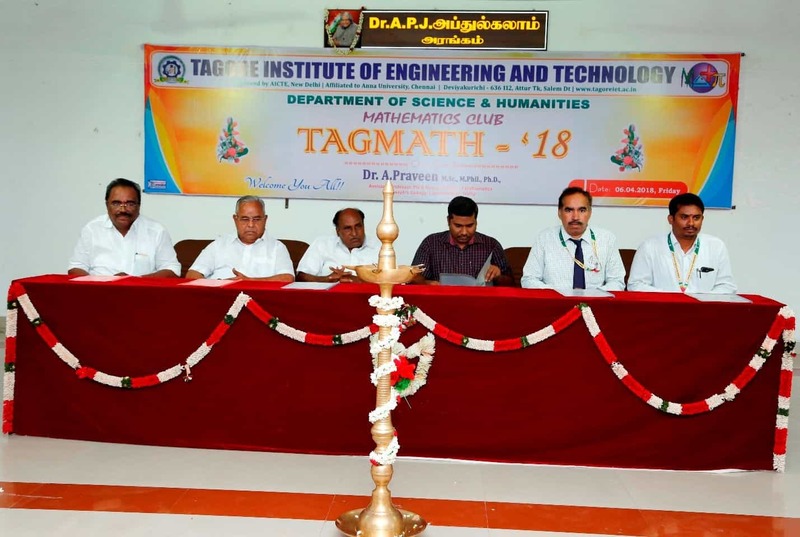 Department of Science & Humanities inaugurated and initiated the Math Club TAGMATH ’16 at our college with the view to develop the basic knowledge in Mathematics for the students. 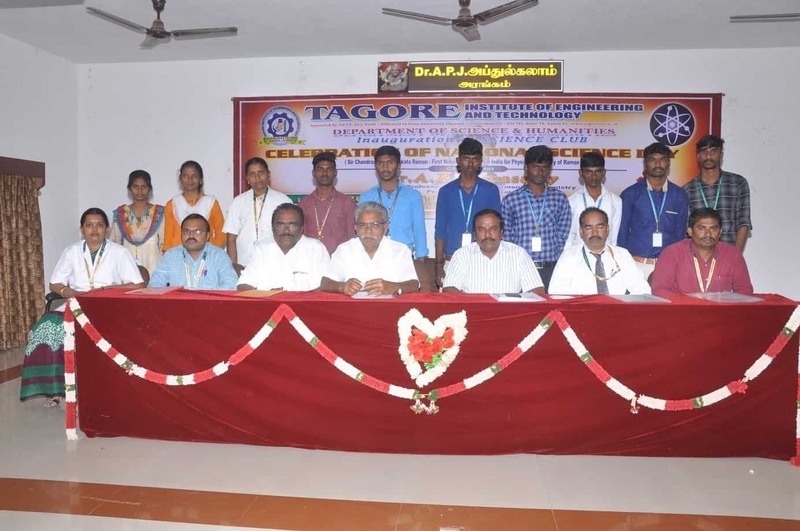 The MathClub of Tagore Institute of Engineering and Technology was inaugurated in the name of TAGMATH ’16 on 30.09.2016 (Friday) at APJ.Abdul Kalam Auditorium. The inaugural ceremony of the club was started at 10.30 am with the prayer song. After, the traditional custom of lightning the lamp was done by the dignitaries. The ceremony of lightning the lamp had been initiated by the Joint Secretary, Tagore Educational Institutions and was followed by the Educational committee member, the Chief Guest, the Principal, the HOD of S&H and a student. Student Representative welcomed the gathering. Dr.S.Senthilkumar, the Principal of the college delivered the Principal’s address. Followed by, the students had given speech about great mathematicians. Then, the class toppers in internal exams had been appreciated and distributed the prizes by the dignitaries. Further, the Presidential’s address, Mr. N.R.Palanivel, Educational committee member, explained the importance of Mathematics in engineering and the development of Mathematics club in our college. Later, Students Representative introduced honorable Chief Guest. After, Joint Secretary, the directors were honored the Chief Guest with a shawl and a bouquet. Subsequently, Asst. Prof. Dr.R.Vikrama Prasad, the Chief Guest of the day delivered a detailed key note address on the characteristics of Mathematics and the methods of learning the Mathematics by the module. Also, the chief guest were appreciated all the toppers. After, in the way of thanks giving, the Students Representative proposed the vote of thanks. Then the function came to an end with National Anthem. Department of Science & Humanities decided to inaugurate the English Club TAGMEMICS ’16 at our college with the view to develop the Communicational skills , besides augmenting their personality traits. It has been decided that various events should be conducted by the club from time to time. The English Club of Tagore Institute of Engineering and Technology was inaugurated on 22.08.2016 (Monday) at APJ.Abdul Kalam Auditorium. The celebration was named TAGMEMICS ’16. The inaugural ceremony of the club was started at 10.30 am with a song of invocation followed by the traditional custom of igniting the lamp. The ceremony of the igniting the lamp had been initiated by the Joint Secretary, Tagore Educational Institutions and was followed by the director, the Chief Guest, the Principal, the HOD of S&H and a student. After the ignition of lamp, Joint Secretary, the directors were honored the Chief Guest with a shawl and a bouquet. Student Representative welcomed the gathering. Dr.S.Senthilkumar, the Principal of the college delivered the Principal’s address. Followed by the Presidential’s address, Mr. N.R.Palanivel, Educational committee member, explained about the development of the English language in India Subsequently, Prof.Geoffrey Davidson, the Chief Guest of the day delivered a detailed key note address on the characteristics of English language and the methods of learning the language by adapting an easy-to-follow approach. Students Representatives are introduced before the dignitaries and students. As a part of TAGMEMEICS ‘16, various events were conducted by the English Club. Moreover, the winners of the events were appreciated and honoured during the function. All the winners who attained the first position were encouraged with trophies and certificates. Winners who attained either second or third positions were appreciated with certificates of appreciation. The certificates and trophies for the winners were granted by the Chief Guest, the directors and the Principal of Tagore Institute of Engineering and Technology. Further, all the winners were appreciated by the dignitaries of the day. T. Krishnakumar, Nicola Pinna, K. Prasanna Kumari, K. Perumal and R. Jayaprakash "Microwave-assisted synthesis and characterization of tin oxide nanoparticles", Materials Letters, Vol. 62, pp.3437-3440, 2008. T. Krishnakumar, R. Jayaprakash, V.N. Singh, B.R. Mehta and A. R. Phani "Synthesis and characterization of tin oxide nanoparticle for humidity sensor application", Journal of NanoResearch, Vol.4, pp91-101, 2008. T. Krishnakumar, Nicola Pinna, K. Perumal and R. Jayaprakash "Preparation and characterization of SnO nanoplatelets by microwave Innovative technique", American Institute of Physics (AIP), pp122-125, 978-0-7354-0523-3/08. T. Krishnakumar, R. Jayaprakash, Nicola Pinna, V.N. Singh, B.R. Mehta and A. R. Phani "Microwave-assisted synthesis and characterization of flower shaped zinc oxide nanostructures", Materials Letters, Vol. 63, pp.242-245, 2009. T. Krishnakumar, R. Jayaprakash, M. Parthibavarman, A. R. Phani, V.N. Singh "Microwave-assisted synthesis and investigation of SnO2 nanoparticles", Materials Letters, Vol. 63, pp.896-898, 2009. T. Krishnakumar, R. Jayaprakash, Nicola Pinna, A. R. Phani, M. Passacantando and S. Santucci "Structural, optical and electrical characterization of antimony substituted tin oxide nanoparticles", Journal of Physics and Chemistry of Solids, Vol.70, pp.993–999, 2009. T. Krishnakumar, R. Jayaprakash, N. Pinna A. Donato, N. Donato, G. Micali, G. Neri, "Sb-SnO2 Nanosized-based resistive sensors for NO2 detection", Journal of sensors, Vol.2009, Article ID 980965, 2009. T. Krishnakumar, R. Jayaprakash, N. Pinna, N. Donato, A. Bonavita, G. Micali, G. Neri, "CO Gas Sensing of ZnO Nanostructures Synthesized by an Assisted Microwave Wet Chemical Route", Sensor and Actuators B: Chemical, Vol.143, pp.198-204, 2009. T. Krishnakumar, R. Jayaprakash, D. Sathiyaraj, N. Donato M. Latino, G. Neri, "Synthesis and characterization of Cd(OH)2 nanowires obtained by a microwave-assisted chemical route", Science of Advanced Materials, Vol.2, pp.1–6, 2010. T. Arunkumar, R. Jayaprakash, T. Prakash, T. Krishnakumar, Sanjaykumar, "Analysis of evaporation rate in the solar still by using the synthesized SnO2 sensor device" Optoelectronics and Advanced Materials Vol. 4, pp. 995 – 997, 2010. T. Krishnakumar, R. Jayaprakash, Nicola Pinna, V.N. Singh and A. R. Phani, "Microwave-Assisted Synthesis, Characterization and Ammonia Sensing Properties of Polymer-Capped Star-Shaped Zinc Oxide Nanostructures", Journal of Nanoparticle Research, Vol. 13, pp. 3327-3334, 2011. T. Krishnakumar, R. Jayaprakash, T. Prakash, D. Sathyaraj, N. Donato, S. Licoccia, M. Latino, A. S. Aricò, G. Neri, "CdO-based nanostructures as novel CO2 gas sensors", Nanotechnology, Vol. 22, pp. 325501-325508, 2011. D. Sathya Raj T. Krishnakumar, R. Jayaprakash, T. Prakash, G. Leonardi, G. Neri, "CO sensing characteristics of hexagonal-shaped CdO nanostructures prepared by microwave irradiation", Sensor and Actuators B: Chemical, Vol.171– 172, pp.853– 859, 2012. D. Sathya Raj, R. Jayaprakash, T. Prakash, Sanjay kumar, G. Neri, T. Krishnakumar, "Impact of n-heptane as surfactant in the formation of CdO nanowires through microwave combustion", Applied Surface Science, Vol.266, pp.268– 271, 2013. N. Rajesh, J.C Kannan, G. Neri, T. Krishnakumar, "Sensing behavior to ethanol of tin oxide nanoparticles prepared by microwave synthesis with different irradiation time", Sensor and Actuators B: Chemical, Vol.194 pp.96-104, 2014. N. Rajesh, J.C Kannan, G. Neri, T. Krishnakumar, "Microwave irradiation effect on structural, optical and thermal properties of Cadmium oxide nanostructures", Acta Physica, Polonica. A, Vol.125, pp.1117-1123, 2014. N. Rajesh, J.C. Kannan, S.G. Leonardi, G. Neri, T. Krishnakumar, "Investigation of CdO nanostructures synthesized by microwave-assisted irradiation technique for NO2 detection", Journal of Alloy and Compounds, Vol. 607, pp.54-60, 2014. T. Krishnakumar, N. Pinna, A. Bonavita, G. Micali, G. Rizzo, G. Neri "Microwave-assisted synthesis of metal oxide nanostructures for sensing applications", Lecture Notes in Electrical Engineering, 91, pp.55-59. DOI: 10.1007/978-94-007-1324-6_7. Krishnakumar T, Marutha senthil S and Jayaprakash R., "Synthesis and characterization of nano crystalline tin oxide (SnO2)", International workshop on Nanoscience technology (Sponsored by UGS and ICTP - Italy), Anna University, February 13th – 17th 2006. Krishnakumar T, Marutha senthil S and Jayaprakash R., "Synthesis of nano crystalline tin oxide (SnO2)", National Conference on advance in Material Science (NCMS-2006), Periyar University, February 16th & 17th 2006. Marutha senthil S, Krishnakumar T and Jayaprakash R., "Preparation and characterization of aluminium ferrite nanoparticles", National Conference on advance in Material Science (NCMS-2006), Periyar University, February 16th & 17th 2006. Krishnakumar T, Marutha senthil S and Jayaprakash R., "Synthesis of crystalline tin-oxide nanoparticle at 60°C", 8th International conference on Nanostructured materials (Nano-2006), IISc, Bangalore, August 20th – 25th 2006. Krishnakumar T, Prasanna Kumari K, Kesevan M, and Jayaprakash R., "Synthesis and Characterization of antimony-doped tin oxide nanoparticle by chemical method", International Conference on NanoScience and Nanotechnology (ICNSNT-2006), Madras University, August 26th-28th 2006. Krishnakumar T, Prasannna Kumari K and Jayaprakash R., "Innovative Microwave technique for synthesizing shape-controlled SnO2 nanopowder", International Conference on Nanomaterial and its Applications, National Institute of Technology, Tiruchirappalli, February 4-6 2007. Prasannna Kumari K, Krishnakumar T and Jayaprakash R., "Synthesis and structural analysis of tin oxide nanoparticle by chemical digestion method" International conference on Materials science research and Nanotechnology, Mother Teresa Women's University, Kodaikanal, February 27-29 2008. Krishnakumar T, Nicola Pinna, Parthibavarman. M, Phani. A.R, Perumal. K and Jayaprakash R., "Structural Investigation of antimony substituted tin oxide nanoparticles by Microwave Technique" International conference on Materials science research and Nanotechnology, Mother Teresa Women's University, Kodaikanal, February 27-29 2008. For the department of S&H, we have invested Rs 29 Lakhs for lab equipments. Dept. Of Science & Humanities celebrated the 7th Inauguration of 1st year students on 27th July 2016. Dept. Of Science & Humanities inaugurated the English Club- TAGMEMICS and celebrated the 70th Independence Day celebrated on 22.08.2016 (Monday). Dept. Of Science & Humanities inaugurated and celebrated National Science Day on February 28, 2017. Our Staff Members K.Kathick, P.Sakthivel, L.Mohanapriya, and K.Ramesh produced 100% result in 2016-2017.